3G3 is technically sophisticated weapon design supplement for virtually any role-playing game. You can design weapons of any type at any Tech Level where they are possible (not just historically available), and then convert that design to the role-playing game you prefer most. 3G3 lets you design conventional firearms, lasers, particle beams, railguns or gauss weapons, melee weapons, bows, crossbows and siege engines. The current edition has detailed system conversion information for TimeLords™, CORPS™, GURPS®, Hero System®, Cyberpunk 2020®, Heavy Gear™, Battlelords of the 23rd Century™, Nexus™, Feng Shui™, Traveller New Era®, and Traveller 4th edition®. Plus guidelines for most every other type of role-playing system. How's that for value for your gaming dollar! 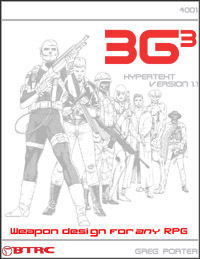 3G3 includes a 146 page rulebook with charts, tables and conversion notes for nearly a dozen role-playing systems.